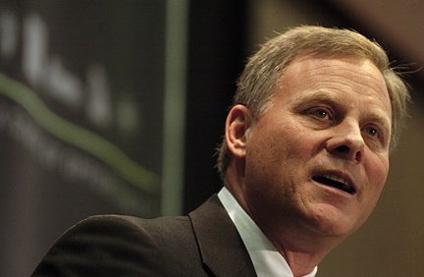 Senator Richard Burr is probably the most cautious politician you’ll ever meet. Whenever he speaks to the press, he speaks slowly and chooses his words very carefully, as if a campaign tracker is behind him ready to pounce on a career-ending gaffe. Thus, with only one notable exception, Burr rarely says anything that can hurt him politically. So it was somewhat out-of-character for Burr to characterize defunding Obamacare as “the dumbest idea ever”. Tea Partiers were livid. Now, an organization called the Senate Conservatives Fund is going after Burr on the radio, saying that funding Obamacare is what’s really dumb. Burr’s office is no doubt getting a lot of angry phone calls and e-mails from outraged conservatives, but it’s unlikely that this will sway the senior senator. After you call something the “dumbest idea ever” it’s a little tough to turn around and vote for it. I imagine that this is Burr’s last term in office, and not because of the threat of a challenge from the right. The U.S. Senate is not a fun place to be right now, and it could be that Burr is sick of Washington. One of Burr’s closest friends in the Senate, Saxby Chambliss, has already announced that he’s retiring. Gone are the days when being a U.S. Senator meant prestige. Nowadays, lobbyists are probably more respected. The U.S. Senate used to be called the world’s greatest deliberative body, but now it’s probably one of the worst. There’s partisan gridlock, anger, and mistrust. Voters are angry. For mainstream Republicans, it’s a particularly grueling experience. Simply put, serving in Congress is no longer a pleasant experience, and recent events have probably made Burr’s tenure even more unhappy.